Love your sweet card! So much exciting news, congrats on all the grandbabies! And sorry to hear your Dad is still not well, keeping him in my prayers! I have tried to get in my craft room, sadly it is just not possible at this time. The girls have just too much going on and with only a couple of years left of school I need to spend my time wisely! Sure miss everyone! Any plans to come visit? The CKC convention will be here in September, I can only go 1 of the days because it conflicts with cross country, keep me posted! Babies, babies and more babies. How exciting to have 5 grandchildren. Praying for our dad and that he recovers very soon. You cards are stunning my friend. Love the colors, pattern paper, die cutes and added ribbon andd flowers. Very elegant! Lovve them. Lovely card!! 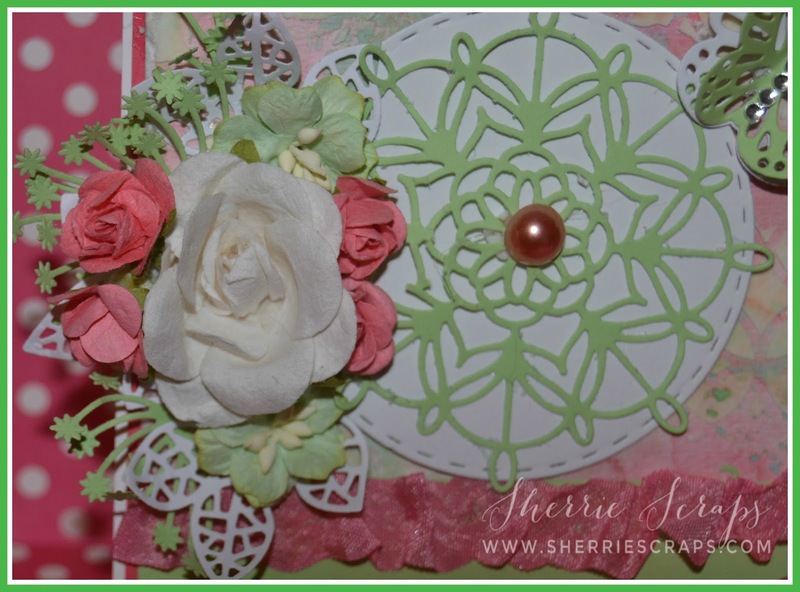 Thanks for Joining over at Fun-day Friday Jo's Scrap Shack. So glad you found a little time to craft, and what pretty cards you created! I love the pink and green combination, and there are too many wonderful details about these to call them "quick and simple". Take care of yourself during these busy times, and thanks for sharing with us at Jo's Scrap Shack. Oh my friend, these are absolutely stunning!! The colors are amazing!! What a spectacular background!! I love the Worn Lipstick and Cracked Pistachio together!! The doily is gorgeous and the flower cluster is beautiful!! Love, love these my friend!! Thanks so much for sharing them at DL.ART!! I'm glad you were able to squeeze time in your craft room!! I've so missed your projects!! I hope Oliver Jay and Kimber Ann are doing great and getting lots of grandma hugs :) Your Dad is in my daily prayers. Thinking of you my dear, sweet friend and sending lots of hugs!! Happy Thursday!! Such beautiful cards my friend! I love the pretty color palette! !Pink & Green...very Sweet! 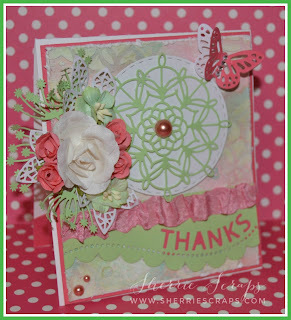 I love the thanks scallop border die. One of my favorites!The details of the butterflies, ribbon and flowers are just lovely.Oh! The background is stunning! I am happy to see that you were able to craft. Enjoy your tine with your family. That is so important in our lives. As for your dad is in my prayers & heart. Super big congratulations on your newest grand babies !! How wonderful !!! These cards are lovely !! Wonderful colors and design !! Hi Sherrie! I'm finally back from vacation! I had a blast & made some special memories with my boys! Glad to be home of course & hopefully get to craft this weekend! Just wanted to stop by & let you know I'll be back to checking out your blog again! :) Your cards are wonderful.. and congrats on the 2 newest grand babies.... I can't believe it's up to 5 grand kids already... I remember when you announced the first grand kid... my goodness time flies! I hope your Dads recovery is going well... Wishing you love & hugs sweet friend! :) Have a wonderful day! Oh my, Congratulations on the new Grand Babies. So excited for you. Love the card. Having lots of problems on my blog. Photobucket Is taking all my 3rd party links away. Yours is still there for now. Not sure what to do. Saying a prayer for your Dad. This card is so so so pretty! Love the pink! Wow! So pretty in pink. These are so beautiful!! Hope your dad is doing a bit better. Hugs!